Veneers can dramatically change the color and shape of the tooth to give you a big cheerful smile. This is a great option for patients that want to enhance their esthetic appearance and want a brighter smile. A veneer is a thin shell restoration that is made of a tooth colored material (usually porcelain). These restorations are ideal for patients that have small teeth, or minor gaps between their teeth, stained or chipped teeth or misshaped teeth. 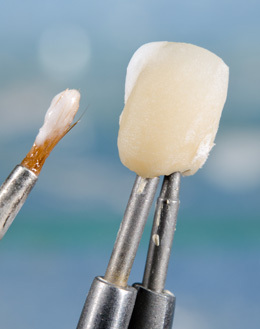 When planning for veneer treatment, impressions of the patients mouth will be made, and a diagnostic wax up is usually necessary to determine the appropriate shape and size of the veneer restorations. This procedure will usually take two to three appointments to complete. It’s like an “extreme makeover” in many ways. Veneers are more durable and stain-resistant than bondings or fillings. They are also more conservative than crowns because they only cover the front part of your tooth. Patients still have to be careful not to put detrimental forces on them to prevent them from chipping. This is a nice and conservative way to improve or enhance a patient’s smile and self-esteem!